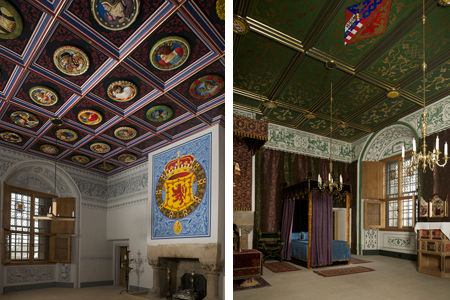 The newly restored King’s Palace at Stirling Castle is not to be missed. All the Royal Apartments are sumptuously refurnished – no, not just refurnished, rebuilt from floor to ceiling. There are six rooms in all, Outer, Inner and Bed Chambers for both the King and the Queen. Last time we went round, the walls and ceilings were crumbling – now just look at the pictures. Particular features are the ceilings with in the King’s inner chamber wooden roundels all newly recarved and decorated. And while the Kings Chambers are largely unfurnished the Queen’s are as they would have been. You see artists sketches what the rooms would have been like but its only when you see it in reality can your really appreciate the sheer lavishness of how the nobles ate the time lived. In the Queen’s bedroom there was the Queen’s attendant whose duties started at 5 am and finished at 2 am the next day and she was expected to sleep on the floor next to the Queens’ four poster – Noblesse Oblige! For a little of the history, the palace was created by James V of Scotland for his newly wedded second wife Mary of Guise or perhaps by Mary of Guise for a place fit for herself as a French Noblewoman to live in. In practice that’s what it turned out to be as James V was defeated in battle by the English – returned and rapidly gave up the ghost. Mary Queen of Scots was born just five days before the King died. But enough of history – the Palace and the Great Hall which was finished some 10? years ago are a reminder of what Scotland can get done if it really tries. Not just the architects and renovators but the staff and guides who show off proudly their new possessions.